MANILA, Philippines – It was a tearful homecoming for JYJ member Park Yoochun from the band’s successful concert in South America when he learned that his father passed away on Mar. 14. Yoochun arrived at Incheon International Airport on the afternoon of Mar. 14 from his flight from the US. 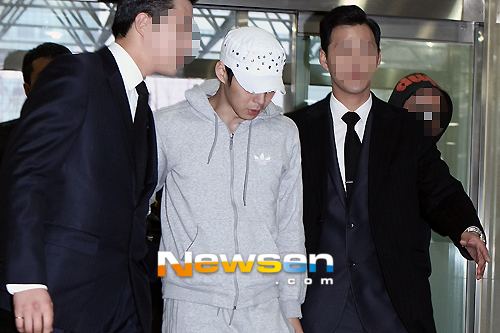 Photos showed a grief-stricken Yoochun walking out of the airport with tears flowing on his face. His father reportedly died of a chronic illness on the early morning of Wednesday. Yoochun’s brother, actor Park Yoohwan also canceled the filming for the drama “Strongest K-pop Survival” when he was informed about the sad news. From the airport, Yoochun went straight to the Seoul St. Mary’s Hospital funeral hall. Several celebrities visited the funeral hall to condole with Yoochun and his family. With the death of Yoochun’s father, the filming for his drama “Rooftop Prince” scheduled on Mar. 15 was canceled. Yoochun reportedly finished filming scenes for episodes 1 and 2 before JYJ went to South American for their world tour. The filming for Episode 3 was to resume upon his return. But with the sad event, the production has decided to reschedule it. “Rooftop Prince” will start airing on TV station SBS on Mar. 21.
International fan sites have organized donation drives to send wreaths to the funeral hall. The death of Yoochun’s dad came after JYJ held successful concerts in Peru and Chile. JYJ’s concerts in South America wrapped up their 15-city world tour that saw about 200,000 fans in attendance. The band made history by becoming the first K-pop group to perform in Chile and Peru.